Clouds can quickly obscure a beautiful night sky. 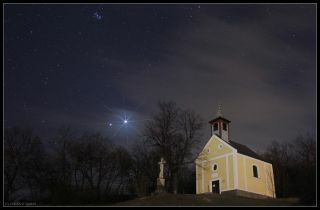 This skywatching photo was taken over a historic church in Veszprem, Hungary, and features the bright light of Venus. Have you ever made preparations for a night of skywatching, when, at the last moment, the sky — which was clear all day — suddenly clouds over, ultimately denying you of that evening's view of the moon, stars and planets? Indeed, there's nothing worse for skywatchers than missing a fantastic night-sky viewing event because of bad weather. To help you get the best sky-viewing experience, there are numerous websites you can use to determine the current weather as well as help you get a pretty good forecast for the next 24 hours or more. Here are some websites that can help you figure out when your local skies will be prime for skywatching. Based on the Canadian (GEM) weather model, Clear Sky Chart is perhaps the most accurate and the most usable forecaster of astronomical observing conditions for more than 1,900 observatories and observing sites in North America. This page, maintained by the National Center for Atmospheric Research, will provide you with the very latest GOES satellite images in the visible and infrared spectrum, as well as water-vapor imagery. You can even loop the clouds to indicate their motion over a time span of up to 12 hours. This page depicts a Full Resolution National Mosaic Enhanced Radar Loop showing the movement of precipitation over the past 70 minutes. You can also adjust it to show a nonlooping image. And if you move the cursor to a specific spot on the map and click, you'll be directed to the local radar view from the nearest National Weather Service Forecast Office. Speaking of the NWS Forecast Offices, this page provides links for about 150 offices across all 50 states, as well as Puerto Rico, Guam and American Samoa. Each Forecast Office provides the latest NWS weather forecast for its particular region as well as more weather info. Located in College Park, Maryland, the WPC is one of nine service centers under the umbrella of the National Centers for Environmental Prediction, a part of the National Weather Service, which is part of the U.S. National Oceanic and Atmospheric Administration. The Weather Prediction Center issues summaries on storm systems bringing significant rainfall and snowfall to portions of the United States.IT also forecasts precipitation amounts for the lower 48 states for systems expected to affect the country over the next seven days. Years ago, as a young boy, I missed out on viewing an amazing skywatching event because of cloudy skies, and in the end, it turned into a life-changing experience. In mid-November 1966, the night of the much-anticipated Leonid meteor shower was fast approaching. Some people were suggesting that the display might turn into a veritable storm of meteors, with hundreds, or even thousands, of shooting stars per hour flashing across the sky. I planned to make the most of it, and in the days leading up to the big night, I carefully watched the TV weather forecasts, all of which pointed toward clear weather for the night of the shower. Finally, on the appointed evening, I watched all of the local TV forecasts. They all said the same thing: "Mostly fair skies and cool, with lows in the mid-40s." I briefly stepped outside and saw some high cloudiness in the western part of the sky, but overall, it seemed to be shaping up as a generally clear night. I went back inside, set my alarm clock for midnight and went to bed for a few hours of sleep. When the alarm sounded, I quickly got up and got dressed, excitedly grabbed my star chart and flashlight, and headed out to my backyard. But within 5 minutes, my happy spirits were crushed.Instead of a view of the promised celestial pyrotechnics display, clouds covered the midnight sky like a fresh coat of plaster, obscuring my view of the Leonids. Nearly 50 years have passed, and I still vividly remember the gamut of emotions I was experiencing at that moment: sadness, for I was missing out on what later turned out to be an epic meteor display, with some observers reporting as many as 40 meteors per second; and anger because I was promised fair skies by the local weather seers but instead saw that promise broken. I had arbitrarily accepted that the weather would be clear; it had never dawned on me that the forecast could go so awry. Cloudy skies almost obscured this stunning image by Greg Diesel Walck, taken in Currituck, North Carolina, during the sunrise on Jan. 10, 2012. He used a Sony Alpha 65 camera with a 495mm zoom, ISO 1600, and shutter 1/8 second exposure to take the photo. But I learned a lesson. And on that night, I decided to become "weather savvy" and have a better knowledge of what to expect in advance of an upcoming celestial event. The very next day, I went to my local public library and started taking out books on meteorology and weather forecasting. Then, a bit later, I started buying The New York Times because back then, that newspaper's weather page printed the "official" national weather map from the U.S. Weather Bureau (now called the National Weather Service). Unlike the abstract maps that are found in today's newspapers, The Times' map from half a century ago contained actual weather observations taken from dozens of sites around the country, and depicted the various high and low pressure systems with what most people today probably would call those "squiggly lines" (known as isobars, or contours of equal barometric pressure). Each day, I would buy The Times, cut out the weather section and toss the rest of the paper. Over a span of more than three years, I must have collected more than a thousand maps. I kept them all in a large boot box (a shoe box proved too small). It was my "weather archive." I started making my own forecasts, first by merely comparing several days' worth of maps and making basic extrapolations. Then, later on, if a certain weather pattern looked somewhat familiar to me, I would look back through my archives, weeks, months, sometimes even a year or two, until I found a setup similar to the one I was seeing now. Then, I would combine my extrapolated positions with what had happened in the past, combining meteorology, climatology and some past statistical input to derive a forecast. It had become addictive, and after a while, my forecasting skills had gotten pretty good. I even started posting my daily forecasts in school on the blackboard in my homeroom. How things have changed over the last half century! If I were starting out investigating future weather today, I wouldn't have to resort to cutting weather maps out of a newspaper. In fact, I wouldn't have to look any further than the Internet.